While the C# programming language is "a multi-paradigm programming language encompassing strong typing, imperative, declarative, functional, generic, object-oriented (class-based), and component-oriented programming disciplines",  R is an open source functional programming language  which has become very popular for more complex statistical data analysis. Typically, these two programming languages are seldom used together. There have been attempts to successfully integrate R and C# within the same process using R.NET. However, this project is relatively unused with around 93 downloads on its homepage as of today. One of the primary advantages for using R is the large number of "packages" contributed by users across the globe which can be quickly integrated into any R project for added programming features and functionality. C# on the other hand has some extensive built in libraries for rapid parallel programming development which are simply hard to surpass. I was recently excited to discover that the standard R installation includes a program called Rscript.exe which can be used from the command line to execute R programming code contained within a file. After a little experimenting, I was able to write a small class within C# which will execute any R program file using Rscript.exe. In fact, you can even pass variables back and forth between the two languages interchangeably within a single processing pipeline. Comparing two image's luminosity histograms to measure image similarity. The only cumbersome part of using the RScriptRunner's RunFromCmd() function is making sure that you provide the correct location for the Rscript.exe program. 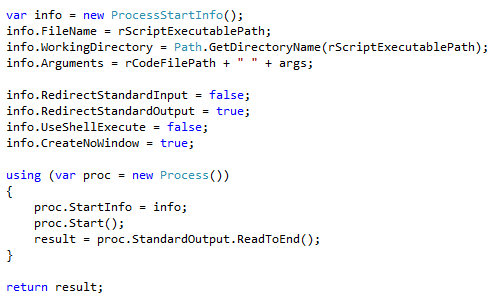 On my machine, this was as simple as providing the value "Rscript.exe". However, on other computers where Rscript.exe is not recognized as a valid command line command (i.e. a proper path / environment variable was not set), this argument may require a fully qualified path for the "Rscript.exe" program. My best advice would be to figure out what is required to enter in the command line window to start Rscript.exe and then use that value. Figure 2 - Run R code from C# and then use the results. Figure 3 - Using a C# variable in an R program. Since the output file location for the ImageClustering.r program was actually provided by C# as the variable "clusteringOutput" in Figure 2, the C# program can easily begin to process the output created by the R clustering program when the RscriptRunner.RunFromCmd() function call completes. The last foreach() loop in Figure 2 demonstrates C# reading in the clustering assignments created by the ImageClustering.r program. "Luminance is a photometric measure of the luminous intensity per unit area of light" which "describes the amount of light that passes through or is emitted from a particular area, and falls within a given solid angle." Relative luminance follows this definition, but it normalizes its values to 1 or 100 for a reference white. When separated into RGB components, a luminosity histogram acts as a very powerful machine learning fingerprint for an image. Since these type of histograms only evaluate the distribution and occurrence of luminosity color information, they can handle affine transformations quite well. 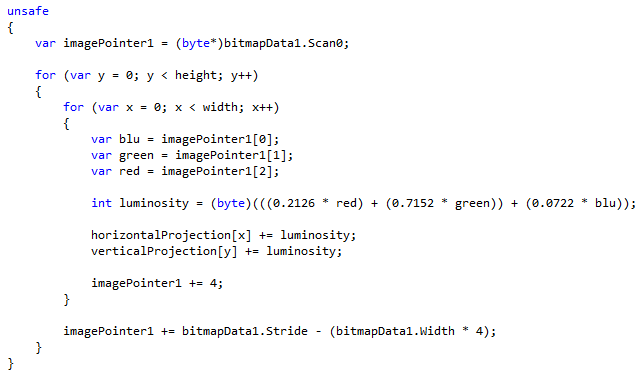 In simple terms, it very easy to separate the RGB components of an image using C#. In fact, using the "unsafe" keyword you can very, very rapidly calculate the relative luminance of each pixel within an image. 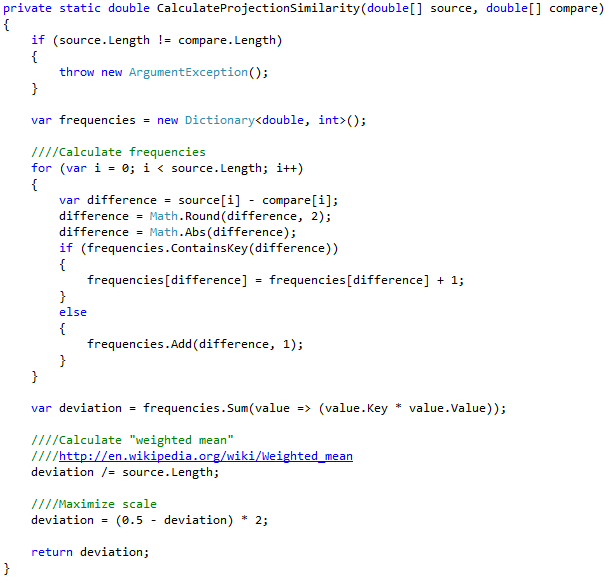 I am certainly not the first person to think of doing this in C# either. There are several C# Computer Vision pioneers who deserve some credit in this regard. [7,8] For this project, I was able to quickly adapt the luminosity histogram feature extraction program contained within the Eye.Open library. Figure 4 - Use RGB channels from image to calculate luminosity for each pixel. Once an image has been processed, both vertical and horizontal luminosity histograms are extracted and retained for similarity calculations between images. Figure 4 shows each pixel's red, green, and blue channels being isolated for use within the luminosity calculation. Images can quickly be compared for similarity using the similarity function shown in Figure 5 which calculates the deviation between two histograms using the weighted mean. Once both the vertical and horizontal similarity have been calculated, the maximum or average vertical / horizontal similarity is retained for each image pair to create the pairwise image distance matrix. Figure 5 - Luminosity Histogram Similarity Function. A parallel pipeline within the demo project is used to "map" images into luminosity histograms while simultaneously "reducing" luminosity histograms into a pairwise distance matrix. For those of you wondering, a pairwise distance matrix is simply a matrix that contains a measure of dissimilarity for all possible pairs of images considered. Dissimilarity for a pair of images is calculated as 1 - the Similarity between both images. The distance matrix will always contain (n^2 - n ) / 2 meaningful entries where n equals the total number of unique items in the matrix. This is due to the fact that all items will intersect with themselves down the center diagonal, and all values on either side of the diagonal are duplicated and only need to be stored one time. Figure 6 - Only the information below the diagonal is required. The pairwise distance matrix is required as input when using the Hierarchical Agglomerative Clustering function within R. In order to create this matrix in parallel, a three stage parallel pipeline is used. First, pairwise image matches are created using a C# yield return enumeration. 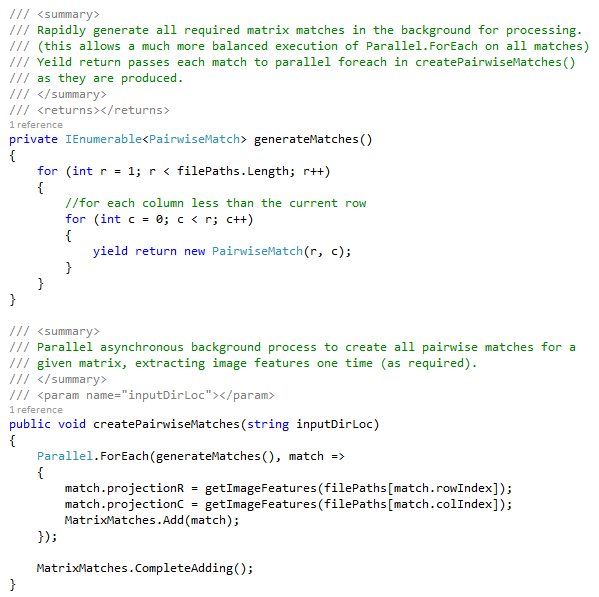 Each time the generateMatches() function in Figure 7 produces a pairwise match, processing stops and "yield returns" each match to the createPairwiseMatches() function's Parallel.ForEach loop. Figure 7 - The MapReduce Mapping Stage. The createPairwiseMatches() function shown in Figure 7 above, extracts features in parallel mapping images to vertical and horizontal luminosity histograms. Furthermore, the histograms for each image are saved in a hash table for quick reference since each image's features will be repeatedly matched to other images. Once the match features are extracted, the match is immediately placed in a thread safe blocking collection for further downstream reduction processing. While the mapping functions shown in Figure 7 are executing in a background thread, parallel reduce functions simultaneously execute processing each completed match produced to calculate the similarity between the match images. Figure 8 - MapReduce Reduction Stage. Once this process has completed, a pairwise distance matrix is saved to disk which can be used as input into the R program's Hierarchical Agglomerative Clustering engine. Similar to Figure 6 above, the final distance matrix contains pairwise distances for all images in the input directory. Figure 9 - The Pairwise Distance Matrix. The purpose of clustering is to divide a collection of items into groups based on their similarity to each other. Very simplistically... The HAC clustering of images works by comparing the pairwise distances of all images and then grouping them into a structure called a dendrogram. The "dendrogram" is a map of all possible clustering assignments at various dissimilarity thresholds. The dissimilarity threshold dictates the maximum amount two images (or two clusters of images) are allowed to be dissimilar and still end up being merged into the same cluster. Once the dendrogram has been created, all images can quickly be assigned to clusters using any dissimilarity threshold value, which is referred to as the "cut height". The cut height is typically provided by the user. This process can also occur in reverse with the user requesting a particular total number of clusters at which point the algorithm calculates the best cut height to achieve the requested result. 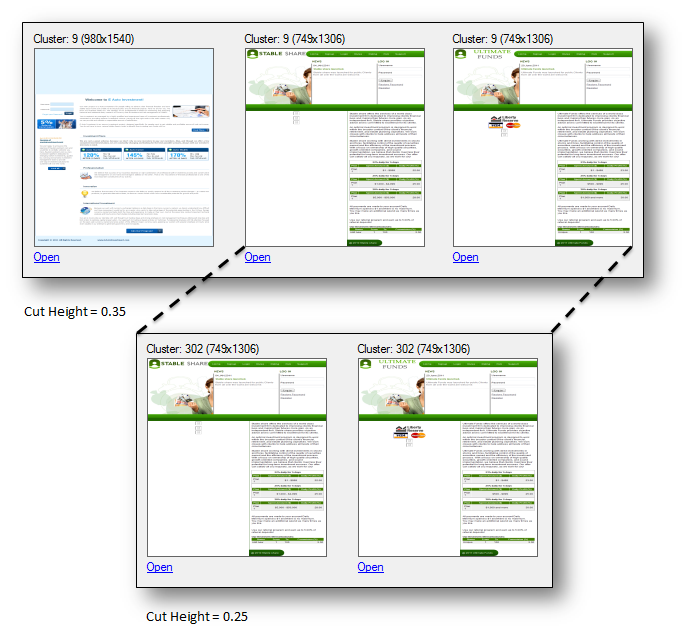 While a small cut height will produce smaller clusters with highly similar images, a large cut height will create larger clusters containing more dissimilar images. What this all means is that the dendrogram maps out all possible clustering memberships based on each image's dissimilarity to the cluster as a group. This can be done using each cluster's minimum, maximum, average, or centroid distances. Depending on what measure you choose to use, the clustering type is referred to by "nerds" as either single-linkage (minimum), complete-linkage (maximum), UPGMA (Unweighted Pair Group Method with Arithmetic Mean) (average), or centroid-based (centroid) clustering. While there are many types of clustering methods, these seem to be the most common. Figure 10 - A Dendrogram for 40 Images. Figure 11 - Cut Height Impact on Clusters. Figure 12 - Cut Height Impact on Cluster Similarity. 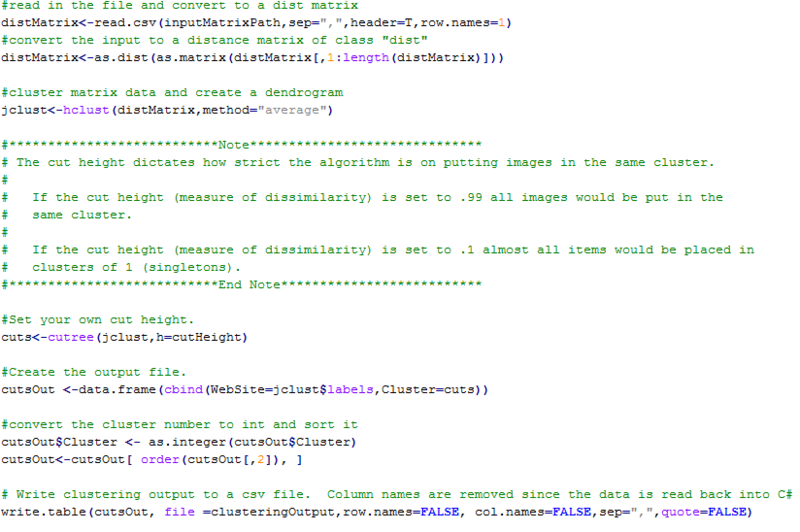 Figure 13 - HAC Clustering Using R.
Once the image distance matrix is saved to disk using C#, the ImageClustering.r program reads in the file and converts it to an R distance matrix (dist) object. Next, the function hclust() creates the dendrogram mapping using the UPGMA or "average" distance method. The cutree() function then cuts the dendrogram to the "cutHeight" which is specified by the user. It is important to note that this value was actually specified by the user on the demo application's form. This value can be seen being passed as an argument from C# to the RscriptRunner's RunFromCmd() function in Figure 2. It is also seen being captured within the ImageClustering.r program in Figure 3. The R clustering program is very efficient clustering the 687 images in just over 1 second on my machine. Finally, the file names are sorted by cluster number and written back to disk. This article successfully demonstrates that the C# and R programming languages can be combined to create powerful parallel processing pipelines using MapReduce style programming and harnessing the analytical powers of R as needed. Information produced in both R and C# can also easily be exchanged and combined across programs when necessary. The demo application provided in the Resources section below uses the powerful parallel programming libraries in C# to rapidly extract and compare luminosity histograms from images creating a pairwise distance matrix for all images contained in a directory folder. Next, C# uses R to perform HAC clustering to combine similar images and then display the output from R on demo application's form. 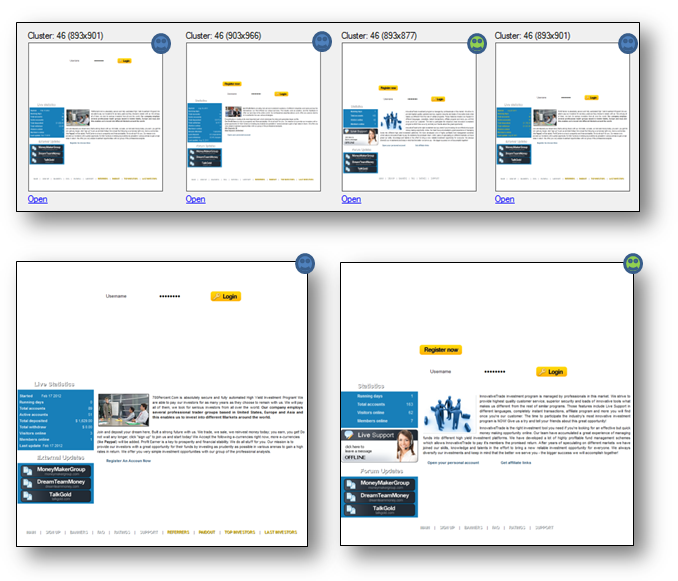 The demo application gives the user a thumbnail preview of the currently selected image row and also the next 3 images below the currently selected image. 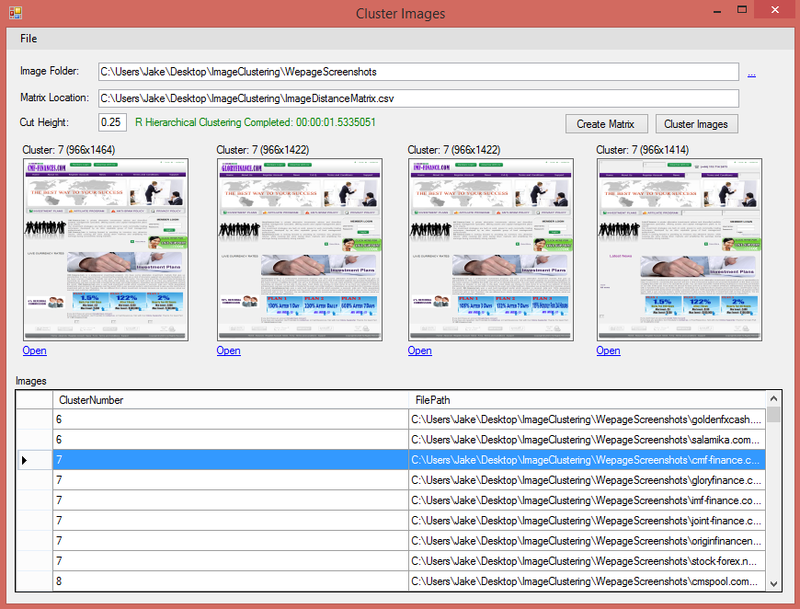 This allows the user to change the clustering cut height and quickly re-run the R clustering program until they are satisfied with the image clustering results. ImageClustering.r - The R program for HAC clustering using an image distance matrix. RScriptRunner - C# class used for executing R programs from C#. ImageDistanceMatrix - C# class which creates a pairwise distance matrix for all images in a folder. RgbProjector - C# Adaptation of the Eye.Open project's code used for extracting luminosity histograms from images and comparing them for similarity. Stack Overflow, Near-Duplicate Image Detection, http://stackoverflow.com/questions/1034900/near-duplicate-image-det..., accessed on 06/24/2014. CodeProject, Haar-feature Object Detection in C#, http://www.codeproject.com/Articles/441226/Haar-feature-Object-Dete..., accessed on 06/24/2014. Mathias et. al., Lire: lucene image retrieval: an extensible java cbir library ,http://www.researchgate.net/publication/221573372_Lire_lucene_image..., accessed on 06/24/2014.